Land use conflict is a fundamental feature of the the human condition. Humans will invariably differ in their expections and aspirations for land use which can lead to conflict. Changes in social conditions (e.g., increasing human population) and/or physical land conditions (e.g., scarcity or deplection of water) increase the potential for land use conflict. Land use confict can be beneficial if it results in a constructive social dialogue about the best use of land to achieve positive social outcomes. Unbounded land use conflict can be violent and socially destructive. In democratic socieities, land use planning serves to harmonize expecations about current and future land allocations through the development of local and regional plans. Permissable land uses following plan allocation are often formalized through zoning ordinances or other regulatory controls. And yet, neither land nor people are static. Even the best of land use plans is temporary in the long run. Social and environmental change provide continual fodder for potential land use conflict. How does one assess the potential for land use conflict? A good starting point is to understand what humans value about the land and their preferences for its use. The potential for land use conflict may be viewed as a combination of both values and development preferences. 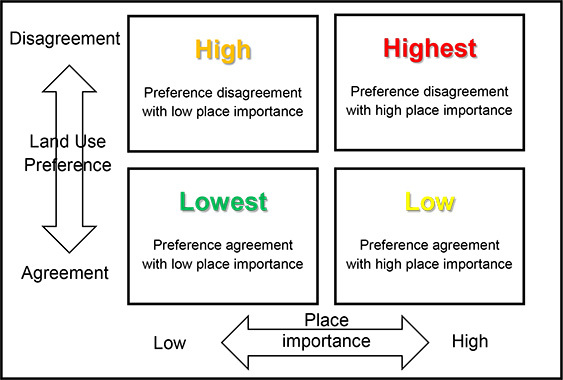 The highest potential for land use conflict will occur in areas where there is development preference disagreement (a large difference between areas of acceptable and inappropriate development preferences) and high place importance (high landscape value intensities). The lowest potential for land use conflict will occur in areas where there is agreement on preferred land use combined with low place importance. Landscape values and development preferences are relatively easy to identify with participatory GIS methods. In this article, we examine a number of methods to identify the potential for land use conflict. Using mapped landscape values and land use preferences from PPGIS data, we develop, describe, and evaluate a number of potential conflict indices. The image below shows the potential for land use conflict for residential development in the Lower Hunter Valley region of NSW, Australia. The conflict index used both mapped landscape values and regional development preferences (supporting and opposing) from PPGIS data. The conflict index values are color-coded to show increasing potential for conflict over residential development in the region. For more information about methods for mapping the potential for land use conflict, contact Greg Brown.